Hop on the party bus and have a hen night like no other! Scrap the idea of going to a nightclub to party and have a unique experience. So, take that party on the road and have a road trip you’ll never forget. Imagine a double decker bus with lush interiors, club-like sound and light system, unlimited supply of alcohol, and your pick of finger food. What’s more, you can be sure that there will be enough space for you to dance. 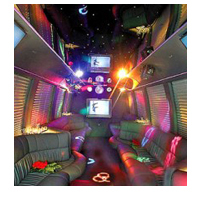 Such a party bus can be the perfect venue for your hen party! Your party does not have to stop at the end of the road either. At the end of the long road trip, if you wish, you can be dropped off a local club so that you can continue your hen party. No need to wait in line, you can just enter as soon as you get there. Of course, we’d understand perfectly well if you do not want to get off the party bus! It’s really up to you.